The U.S. Food and Drug Administration's (FDA) Center for Food Safety and Applied Nutrition (CFSAN) recently published its annual list of program priorities for the current fiscal year. As usual, this document contains an ambitious list of action items that FDA hopes to accomplish in the coming months. It also provides some insight into FDA's basic agenda for protecting the safety of the nation's food supply. Like any regulatory agency, FDA has limited resources and tools at its disposal. As in years past, CFSAN's priorities document poses the question, "Where do we do the most good for consumers?" In other words, how does the agency get the biggest bang for its buck? In putting together the priorities document each year, CFSAN certainly attempts to allocate its limited regulatory resources sensibly. However, CFSAN does not always have complete control over its agenda. It must also deal with Congressionally imposed deadlines. In 2003, for example, CFSAN is under a tight deadline to implement provisions of the Bioterrorism Act of 2002. The tasks on CFSAN's "to do" list are each given a priority ranking of either A or B. The A-list items are expected to be accomplished this year. More precisely, FDA establishes a goal of completing 90 percent of the A-list items in the current fiscal year. This leaves it fairly clear that the B-list items will not be accomplished in the current year. FDA aims for progress on the B-list items, but not completion. Not surprisingly, a large chunk of the CFSAN priorities document is devoted to food security issues and implementation of the Bioterrorism Act. This includes four major rulemakings, two of which the FDA has already issued as required by the Bioterrorism Act: those governing facility registration and prior notification for food imports. FDA is under a deadline to finalize these rules by December 2003. These statutory requirements become effective at that time whether or not the final rules are in place. FDA intends to propose two additional rules this year dealing with the threat of foodborne terrorism. The agency will issue a proposed rule to require the maintenance of records to identify the immediate previous source and immediate subsequent recipient of foods. Section 306 of the Bioterrorism Act indicates that FDA may issue regulations in this area at its discretion, and it appears the FDA intends to do so, but not under a statutory deadline. Section 303 of the Bioterrorism Act authorizes FDA to order the detention of food suspected of being contaminated in ways that could present serious adverse health consequences. This provision is not limited to incidents involving intentional contamination. Again, FDA is not operating under a clear statutory deadline to issue regulations in this area, but the agency has determined that regulations are needed to establish, among other things, an expedited hearing procedure for perishable foods. In the case of these discretionary rulemakings that arise under the Bioterrorism Act, the agency is quite likely aiming to solidify its new authority while taking an expansive view of it. In other words, FDA is sensibly looking to get the biggest bang for its buck from this legislation. Two years ago, no one would have predicted that food security issues would so dominate CFSAN's agenda. A few of the more unexpected items include completion of a "Situation Room" at FDA that, according to the priorities document, should be fully operational at the time of this writing. Additionally, FDA intends to establish a Secure Communications Room and a CFSAN Alternate Worksite. 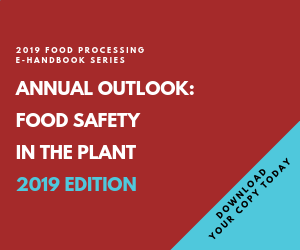 Apart from security issues, CFSAN continues to devote a significant amount of attention to traditional food safety concerns, particularly the risk of microbiological contamination. As indicated in last year's priorities document, FDA again intends to inspect 95 percent of all domestic firms that produce "high-risk" foods. The agency also intends to inspect 225 to 250 foreign firms that produce "high risk" foods. This represents about a 40 percent increase over the number of high-risk foreign food inspections FDA aimed for in fiscal year 2002. It is a striking statistic, meaning that FDA intends to have inspectors visiting foreign food facilities almost every business day during the year. One of the most significant rulemakings related to food safety is FDA's proposed egg safety rule aimed at reducing human illness associated with Salmonella Enteritidis. In 2000, FDA and the U.S. Department of Agriculture's (USDA) Food Safety and Inspection Service (FSIS) jointly held two public meetings to solicit and discuss using a farm-to-table approach to reducing the risk of Salmonella Enteritidis in shell eggs and egg products. This year, FDA intends to issue a proposed egg safety rule arising from these discussions. Another ongoing effort to reduce foodborne illness is FDA's draft risk assessment for Listeria monocytogenes in ready-to-eat foods. The Agency issued a draft risk assessment in January 2001, in cooperation with USDA and the Centers for Disease Control (CDC). One of FDA's A-list priorities this year is the issuance of a revised risk assessment for Listeria monocytogenes. Foodborne listeriosis is a moderately rare but severe disease caused by Listeria monocytogenes. The draft risk assessment issued in 2001 concluded that pregnant women, older adults and people with weakened immune systems are at higher risk for listeriosis. Those consumers were advised not to eat foods that have a greater likelihood of containing Listeria monocytogenes. Examples given included soft cheeses such as Feta, Brie and Camembert. These consumers were also advised not to eat hot dogs and luncheon meats unless they are reheated until steaming hot. CFSAN's priorities document typically includes a few items related to improving efficiency. For example, an A-list priority in this year's document is the elimination of overdue food and color additive petitions. Specifically, the agency intends to reduce to fewer than 10 the number of food and color additive petitions that were received prior to October 1, 2001. Those that submit food additive petitions would welcome faster FDA review of the petitions, as long as this results in fast granting of the petitions. Petitioners would probably prefer inefficient review over fast rejection of food additive petitions. CFSAN is obviously handling a very high volume of important work. The current priorities document identifies 145 A-list items, up from 92 in last year's document. It is safe to assume the agency will not accomplish all of its goals this year; that food safety and food security will continue to dominate CFSAN's agenda next year; and that little or no progress can be expected on matters that do not appear even as B-list priorities in the current document. The entire document is available on FDA's Web site at: http://www.cfsan.fda.gov/~dms/cfsan303.html.